Ark hostel in Osaka had everything we needed and more. It’s location is close to the subway which is super easy to navigate the rest of the city. The staff were really helpful and the room was comfortable and quiet, surprising for quite a big dorm! The included breakfast is a cherry on top of the cake! Really nice place. The staff are friendly and despite being in a big bunk room the curtains blocked out all light and it was really quiet and set to a comfy temperature. They also hosted an awesome free local music night with artists from Osaka when I stayed. Location-wise, it’s not even a 1 minute walk to the nearest subway and it’s walkable from the JR station ( or 1 subway stop away) so it’s really easy to get around the city. Hostel is very clean and nice. Well communicated so it is easy to get wherever you need in Osaka. Nice restaurants around so you don't need to go far in order to eat good :). 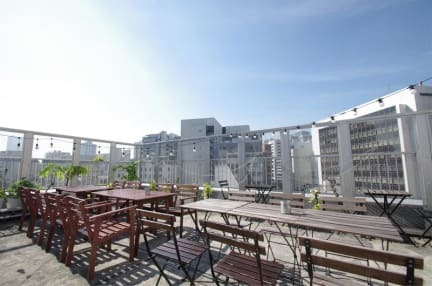 If you are planning to visit Osaka, this place is definitely very good to stay in. Security is good with a keycode for the room and lockbox for valuables. Location is also good as its near two metro stations. The beds are sturdy and private, if a little hard. The facilities are fine, basic but what you need is there. the same can be said for the breakfast. The were only two showers on our floor but this wasn't an issue while I was there. The staff were helpful. Arkhostel was what I expected for the price. Spacious beds, bathroom facilities were good but a bit dirty at the end of the night. The staff were mostly helpful and thelocation was close enough to a metro station - but a bit far from the main touristic area. Nice hostel but shower room closes 5 hours during the day for "cleaning". Extremely inconvenient if you happen to have woken up late.